Mirrored with permission from http://www.onecountry.org/oc73/oc7316as.html. "The reduction of human nature to animal nature is not supported by the findings of any single scientific theory or set of scientific theories." In his new book, The Universe Within, Anjam Khursheed opens a penetrating exploration of the inherent harmonies between science and religion with a deceptively simple question: what is this thing called self-awareness? "At birth children are unable to differentiate themselves from the external world, and as they progress through infancy, childhood and adolescence their consciousness and will seem to grow steadily stronger," writes Dr. Khursheed, a physicist at the University of Singapore. "Consciousness of ourselves dawns upon us. And like the sun gradually rising in the morning, the light of consciousness and self-knowledge shines steadily stronger as our lives progress. Then, like the sun setting in the western skies, consciousness slips away." Before the Copernican revolution, Dr. Khursheed writes, the mysterious phenomenon of consciousness was explained by religion. "Pre-modern human beings viewed themselves and nature in a way that can broadly be terms as spiritual. Pre-modern human beings linked their inner and outer universes by pointing to the divine connection between them." But today the seemingly precise methodologies and astonishing discoveries of science appear to have left little room for a connection to the divine. In the gap, he argues, there has arisen a sense of collective moral confusion, a fragmentation of the human spirit that contributes to many of humanity's deepest troubles, from the displacement of traditional cultures by western materialism to the wholesale exploitation of our environment. "The ecological crisis is now recognized to be a crisis not about our environment but about ourselves," he notes. "The characteristic feature of our age is that the singularly rapid expansion of scientific and technological power is accompanied by an equally momentous fragmentation of spiritual values." Yet, argues Dr. Khursheed, it need not be that way. And this is the main thesis of his book: although it has become widely accepted that science and religion are inherently antagonistic, the true nature of both is such as to make them complimentary means of exploring reality. In the book's first part, entitled "Modern Myths," Dr. Khursheed develops this thesis by leading the reader on a discussion of how scientists and philosophers since Copernicus have sought to deal with the question about self-awareness. The empiricists, led by David Hume, argued that only what could be seen, touched or heard could be counted as real, and that self-awareness was merely the interplay of sense perceptions in a kind of "theatre" of the mind, Dr. Khursheed writes. Yet Hume's explanation for self-knowledge, he says, "is defeated by an infinite chain of perceptions: a set of perceptions observes another set of perceptions, which themselves are being observed by yet another set... and so on. If there is no mind anchoring all these perceptions together, the self becomes an illusion." He uses similar arguments to evince the failure of other modern "scientific" explanations for human consciousness. Behaviorism, he writes, sought to explain human nature as a set of responses to external stimuli. Yet, he writes, "behaviorism suffers from the same problems as Hume's empirical philosophy in that it cannot provide any plausible explanation of self-knowledge and can never achieve objectivity about introspection." Similar problems arise, Dr. Khursheed says, for those who say that the mind is a sort of living computer and our thoughts are nothing more than complex algorithms. "Is self-knowledge the awareness of one's own computational processes as they are occurring?" asks Dr. Khursheed. "If so, which background algorithms are being executed to produce the awareness of these foreground computational processes? "Our self-knowledge is punctuated by desires, intentions and purposes for which no amount of background symbol-shuffling can seem to account," he adds. And he says that those who argue that human nature is merely the sum total of a series of "survival" experiences, compounded by evolution through the eons, face similar problems: if we are merely animals whose reactions and thought processes have been programmed by evolution, where is the explanation for self-consciousness, Dr. Khursheed asks. Such "scientific" explanations have been widely accepted by modern society as proofs that human nature has no spiritual side, Dr. Khursheed believes. Yet such a conclusion is wrong, he writes. Most of the great scientific discoveries have stemmed not from methodologies based on pure logic and rationalism but rather on processes of insight and intuition that are more akin to the mystical experiences that are described in all of the world's religions, he writes. "The reduction of human nature to animal nature is not supported by the findings of any single scientific theory or set of scientific theories," he says. In the book's second part, entitled "Personal Knowledge," Dr. Khursheed writes that scientific discovery is a process of insight and intuition that is quite similar to the religious experience. "Science relies on creative qualities of the mind, as opposed to any methodology based upon empirical observations and logical rules," he writes. He notes, for example, that insights gained from highly intuitive "thought experiments" led Albert Einstein to formulate the theory of relativity. He goes on to suggest that successful scientific investigations also require a kind of "faith" -- a faith in the principle of causality and in the unity of the universe -- and that the really great discoveries, which almost invariably fly in the face of the conventional wisdom, require a genuine "leap of faith." Dr. Khursheed cites Newton's formulation of the first law of motion, which states that a body in motion tends to remain in motion, unless acted on by outside forces. Since there are always forces acting on the motion of an object under observation, such as wind resistance, gravitational forces and so on, Dr. Khursheed writes, it "would have been an impossible feat for Newton to observe the motion of an object with no forces acting upon it. His first law of motion is a statement of faith, an abstraction of the mind." 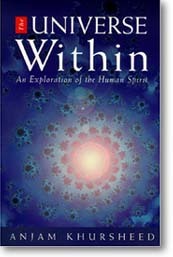 In the book's final part, entitled "The Inner Vision," Dr. Khursheed brings his thesis full circle, arguing that for humanity to achieve the necessary sense of collective self-awareness required for our age, the essential unity of science and religion must become widely recognized and encouraged. "All noble enterprises, science, religion, art and ethics, rely on the spiritual core of human nature prevailing over the influence of other superficial selves. While Descartes' search for indubitable truths in effect reached the conclusion that the spiritual self is more fundamental to human character than any other self, it was not new. All the world's spiritual traditions reach the same conclusion. All religions, for instance, are based upon a belief in the primacy of the spiritual over the material in human nature." On the scientific side of the equation, he writes, the "success of science itself is one of the clearest demonstrations of the power of the mind over the material. The power of thought is still the experience upon which all our knowledge is founded." In its totality, The Universe Within is a powerful book, offering a strong polemic against the materialistic orientation that resonates through much of modern culture. Its arguments are both subtle and clear; it deserves to be read not only by scientists and theologians but also by anyone concerned about the social, cultural and political choices which lie in our collective future.